Taylor Hall is already giving Halloween costume ideas in January! Earlier this week we saw Taylor Hall's face get stepped on... by a skate... with no helmet on. Talk about scary and you know that Oilers nation nearly loafed in their pants as their 2010 NHL Entry Draft 1st overall pick suffered a serious injury. 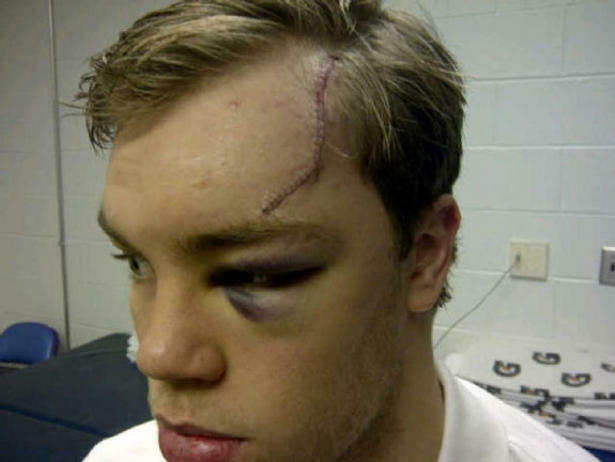 Well, 30 stitches, a black eye, and a lump on his forehead later and Hall should be back playing soon enough. The injury could have been much worse as one inch lower and you're in eye territory. Growing up it was always one of my biggest fears when playing hockey. With so many close calls in my family backyard and at the local shinny rink, I am very lucky that I have never been cut by a skate (knock on wood). However, I have seen a few scary incidents on the ice involving skates. Back in my Juvenile AAA days a teammate of mine dropped down to block a shot and unfortunately for him another player was skating by and basically skated over his wrist. Making matters worse, he was one of the guys that always wore the short gloves. I have never heard someone scream like that before and as he was rushed off the ice you could see the blood just shooting out onto the ice. He never played hockey again. As Thad from Blue Mountain State describes hockey - a sport played on the hardest surface in the world with knives on the bottom of their feet - you can see how when incidents like this happen they are often quite gruesome. While visors, cages, proper hockey gloves, and neckguards can help prevent skate-cut injuries from happening, they are not 100% guaranteed to protect you. In fact, some of the most serious skate-cut injuries in hockey are freak accidents. Here are some of the gruesome skate injuries from the NHL. WARNING these will make you sick to your stomach so view at your own discretion. Rene Bourque suffers a deep cut to the neck from the skate of Nikolai Zherdev during a scrum in the slot. Bourque stated that if the cut was a few milimetres deeper that he might not have survived. Following surgery to repair the laceration, Bourque returned to action four weeks later. Richard Zednik has his external carotid artery cut by the skate of teammate Olli Jokinen that caused him to lose five units of blood. Zednik would undergo surgery and miss the remainder of the season, but would return to play in the NHL again. Clint Malarchuk is cut by Steve Tuttle's skate on the neck, severing his internal carotid artery. Thanks to trainer, Jim Pizzutelli, who pinched off the bleeding, Malarchuk survived the incident. It took over 300 stitches to close the wound, and Malarchuk was back between the pipes a week later. Wear a helmet you loser! What's the point of wearing a helmet during games if you don't during practice! Ah tough guys. Think they're bullet proof? Think they're knife proof? That's worst dude! You should wear helmet all the time even during practice to prevent this kind of accident. I saw that play (and on slow motion) and it was horrifying! It may take a lot of facial reconstruction and scar removal procedures to really get him back to something looking less like a science experiment gone bad. Even the Long Island plastic surgery consultant I showed this to was horrified. Watching these hockey players get accident makes me cringe. Good thing there are Los Angeles plastic surgery who can professionally fix those deformed faces. Accident like this may happen anytime. Plastic surgery can be very helpful in this kind of situation. It's good to know that plastic surgery does not only focus on aesthetics but in restorative aspects as well. Ice hockey is a team sport played on ice, in which skaters use sticks to direct a puck into the opposing team's goal. 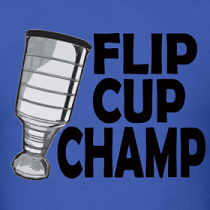 It is a fast-paced physical sport that to be a great hockey player you first have to learn to be a great skater.